Today I’m tackling another design challenge that I have visited in past years. I thought it would be interesting to see how the finished bracelet would look and feel with the recent updates to my collection. Over the past couple of years I have made a conscious effort to add certain shapes and sizes of silvers to my personal collection. 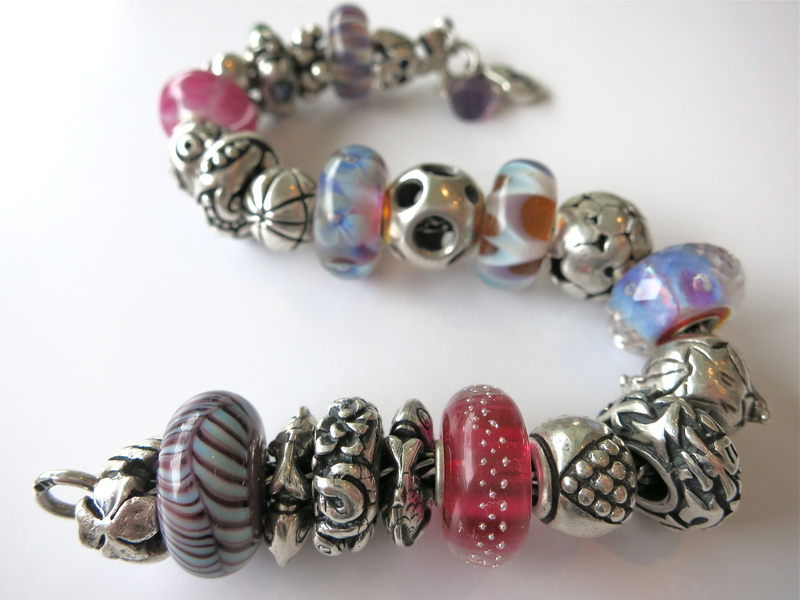 I’m very particular about each silver – it has to have a meaning that makes me happy, but it also has to function well for the way I like to build my bracelets. I tend to make balanced compositions, so that means that pairs of silvers are useful. However, with very few exceptions I tend not to actually buy duplicate designs, but rather prefer to find patterns that are complementary to each other in both theme and dimension. 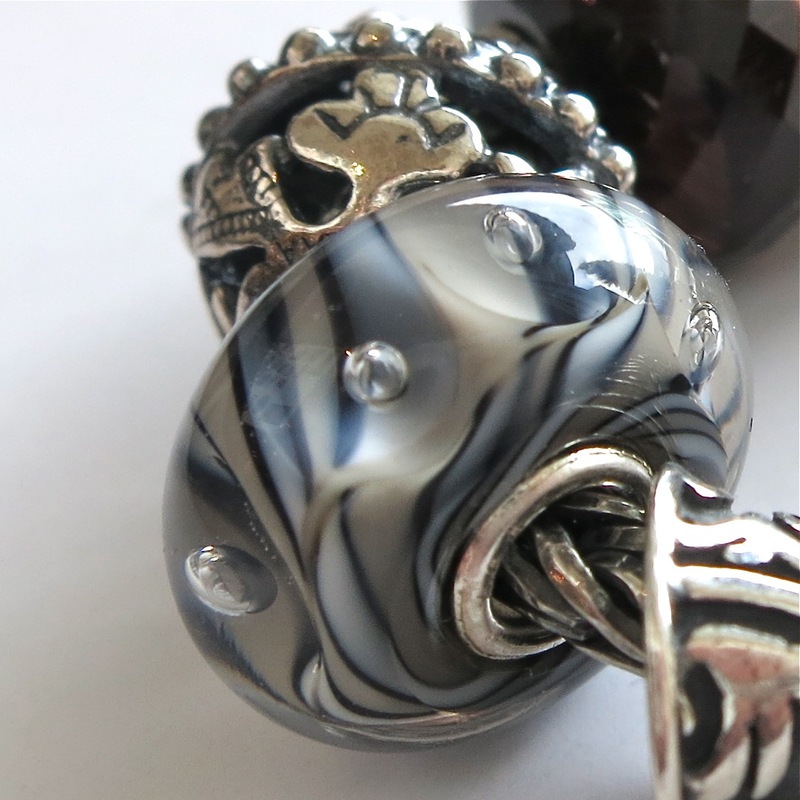 Luckily for me, Trollbeads tends to have a few relatively standard size grades within which they produce a number of designs. 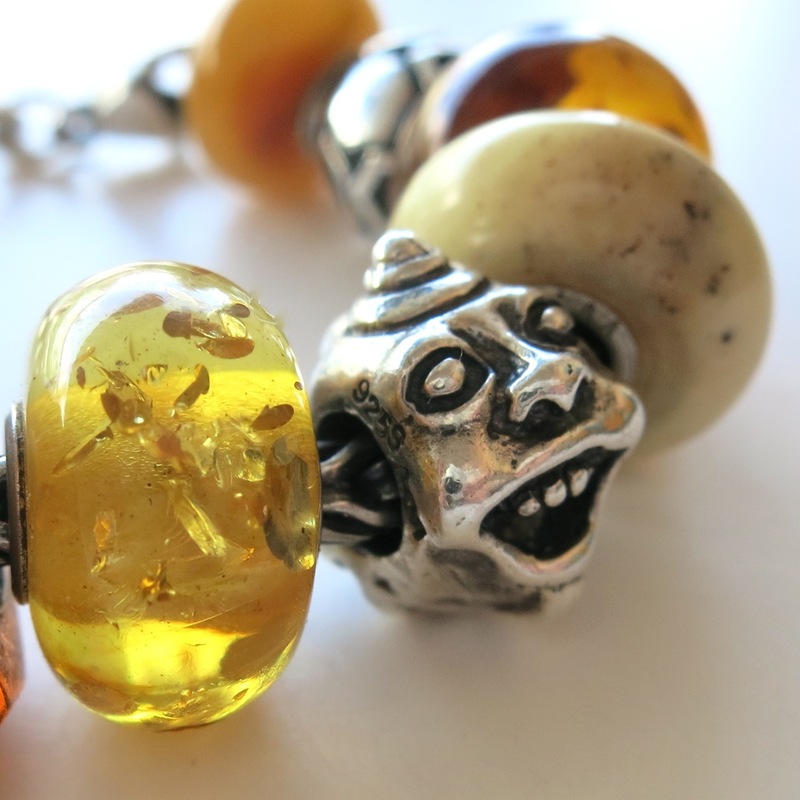 For example, “Jugend””Carved Flowers””” and even the “Rolling Troll” all have a similar form and size, so they work well to balance each other in a bracelet. I often use “Ball of””Sweater” together for the same reason. 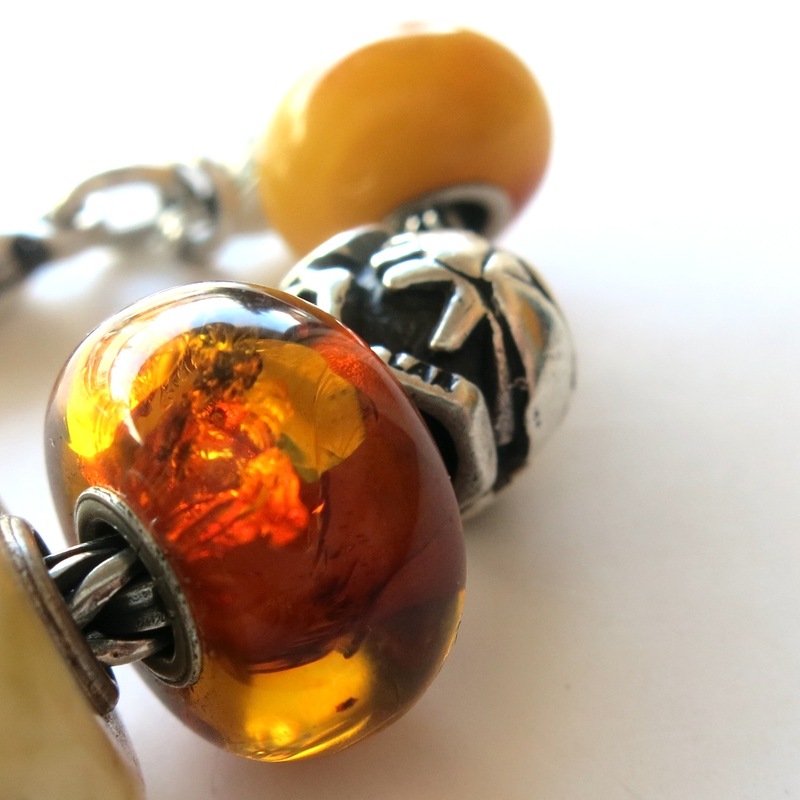 One bead that I simply had to twin in my collection was the “Bee on Hive”… it’s one of my favorite silvers, as it features the Bee image that I take as my personal emblem. It’s soooo useful to have that one pair for bangles, necklaces and so on. 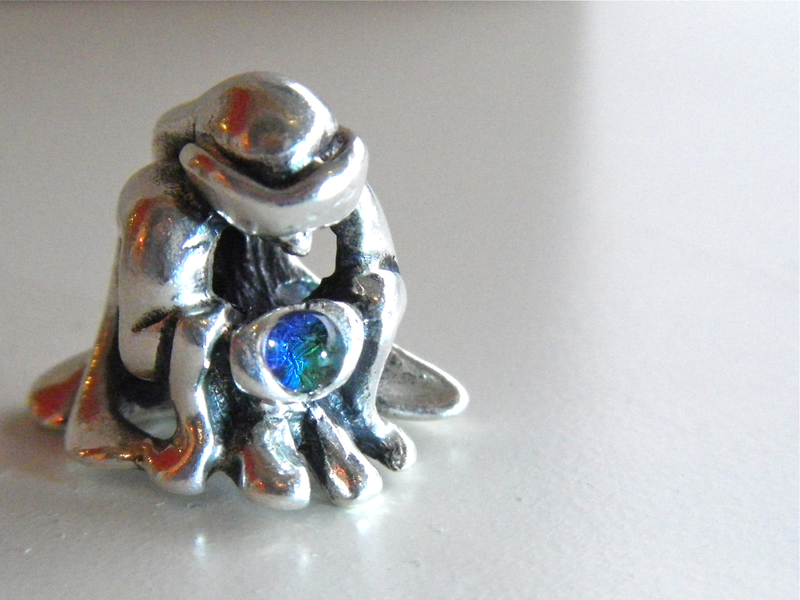 I like to group silvers not only by appearance, but also to some extent by narrative theme. For example, I usually place my “Ball of Yarn” and “Sweater” together on a bracelet along with my “Spider”. I like to think that the spider is a crafty little knitter of webs. Similarly, I place my “Frogs”, “Neither Fish Nor Bird” and two “Happy Fish” on a design together for a wetland sort of a theme. Perhaps the most relevant habit that I usually employ, however, is that I always…*nearly always* mix the glass or stones in with silver. Occasionally I might make a bangle with only one metal bead. 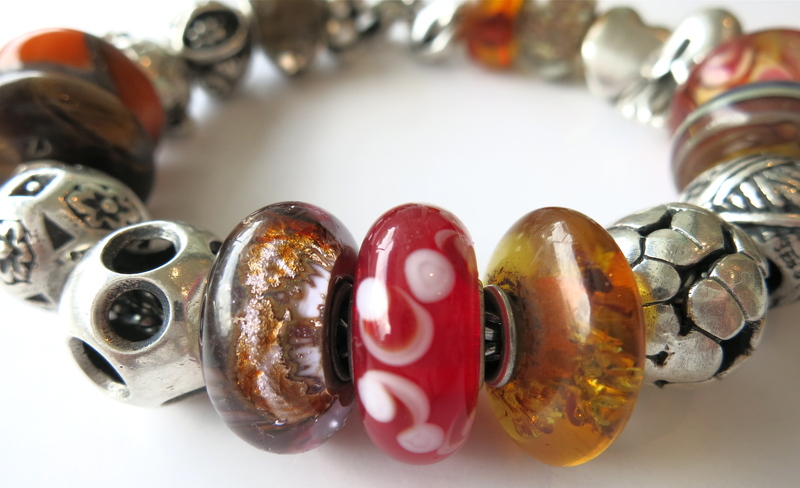 From time to time I might make up an all-amber or all-glass bracelet. But all-silver? Nope. Only for the challenge! It’s a tough one for me, as it’s missing the colour elements that are my comfort zone. 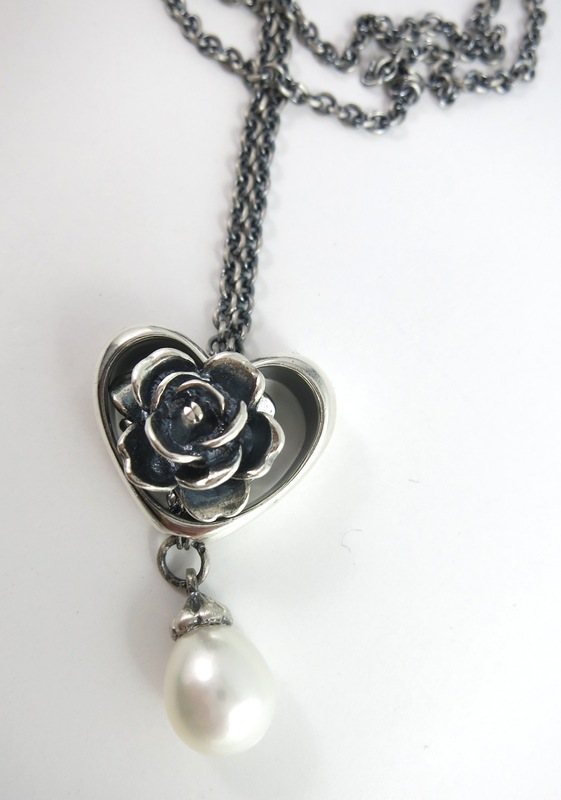 It’s also very tricky to build all-silver while creating a sense of order to the design. 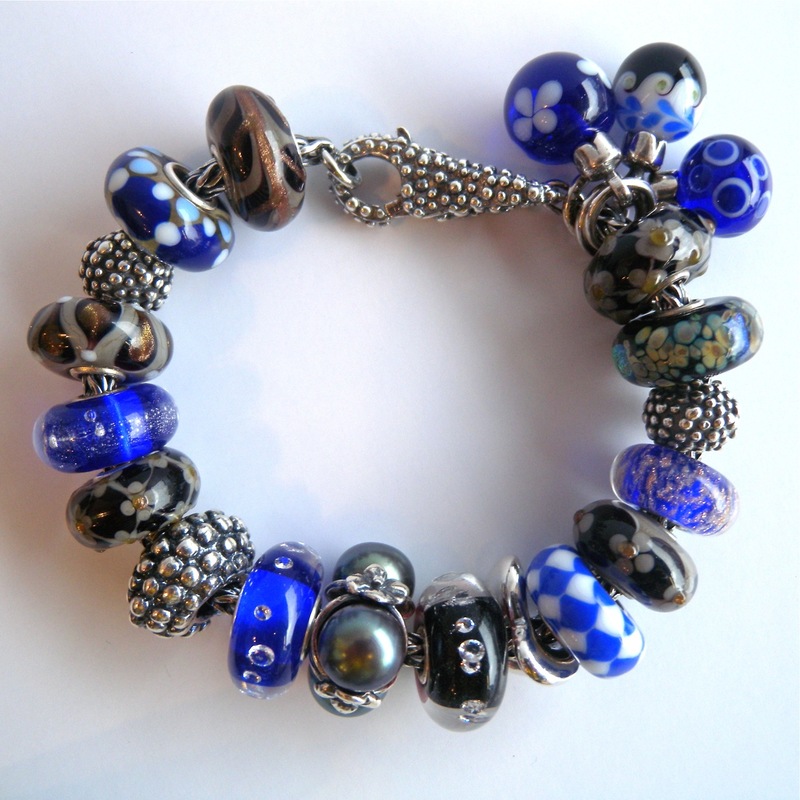 This year, with the addition of more size pairs, I think I’ve managed to design a bracelet that I would make and wear again. 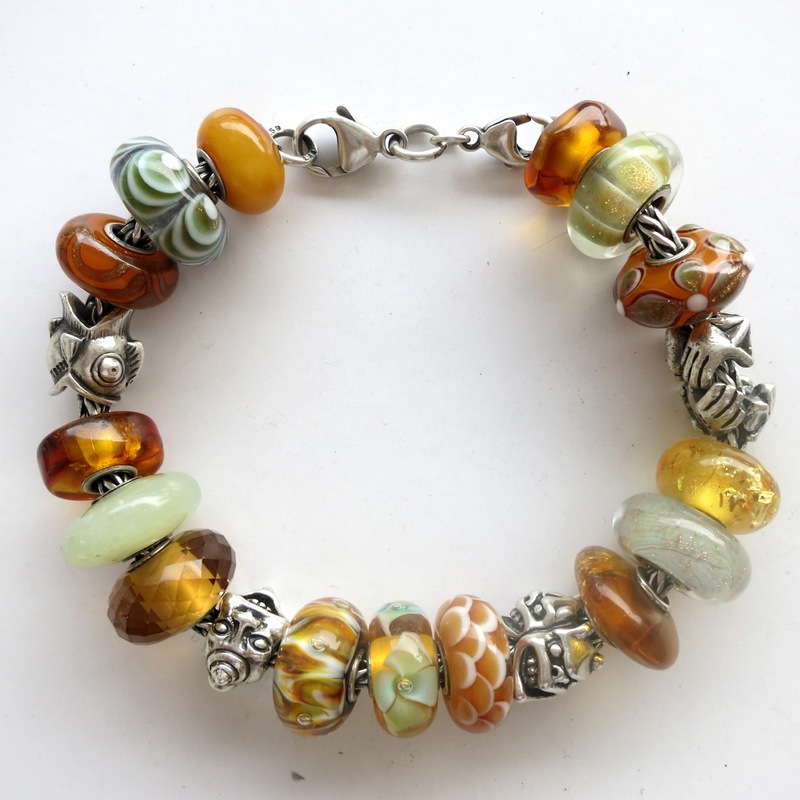 It has a very comfortable amount of movement on the bracelet, which results in a very fluid feel in the hand. It’s satisfyingly heavy and I am enjoying wearing it today! Everyone needs a couple of “Day to Day” jewellery designs. I have rings that are worn so often that they feel like part of my hands… a couple of necklaces that are daily apparel, and of course a few bracelets that are particularly beloved and useful. 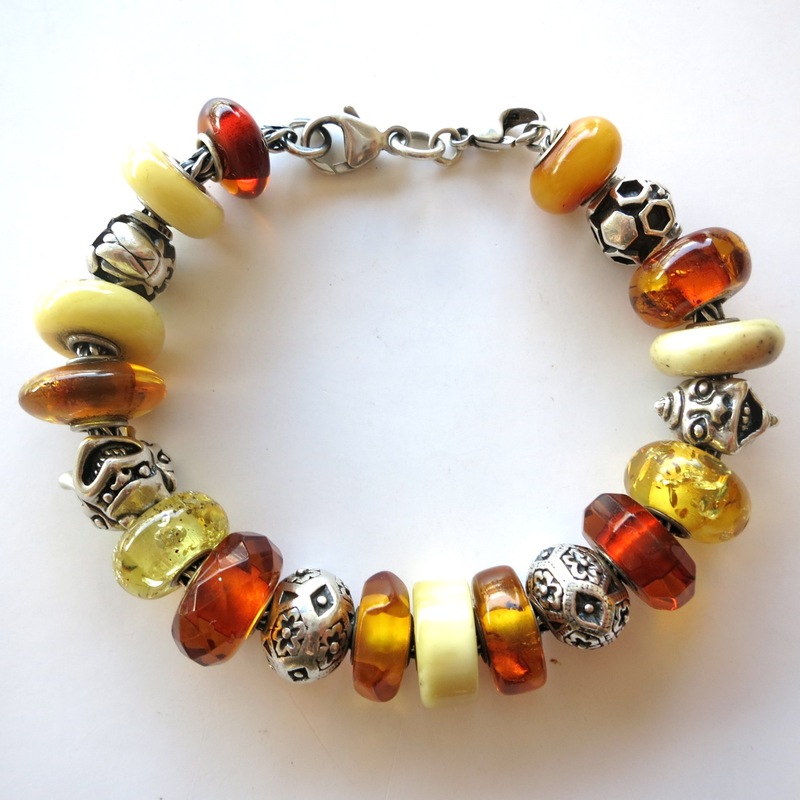 If you are a die hard Trollie, you immediately know which of your own designs fall into this category… it’s the bracelet that always travels with you… the one that just seems to go with everything… the one that perhaps you are wearing right now? The appearance of that bracelet will of course vary according to your taste and needs, but for me it always seems to be some combination that features soft greys. So today, I decided to dive into the case of current bead stock and see what sort of “Day to Day” bracelet design I could play together. I’m quite delighted with the result. 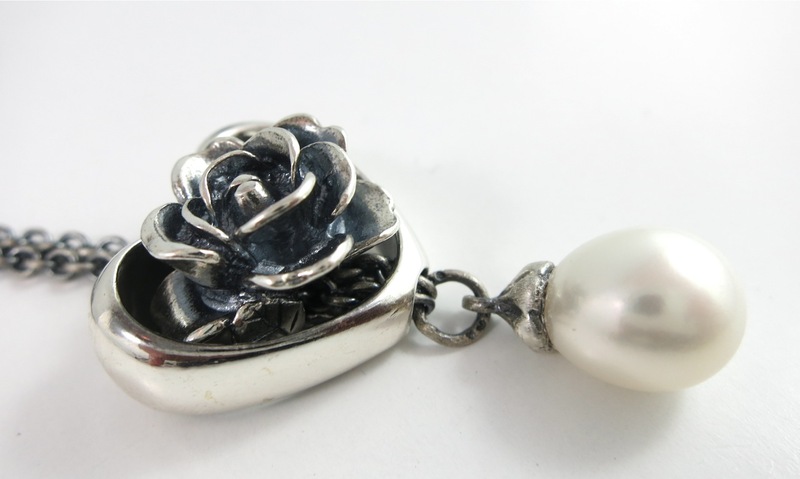 I started by combining two “Triple Pearl” beads, one an inky blue-grey and the other a perfectly clean white. These are large-scale beads that combine both pearls and detailed silver hydrangeas for lots of drama, so they needed companions that could stand up to them. I centred a silver “Big World” and framed it with a nicely marked “Dendritic Agate” and a stunning Sapphire. I rounded out the silver component by adding the design siblings of “Spiritual Adornment” and “Spiritual Ornament”. A handful of well-chosen and complex uniques help to complete the look. 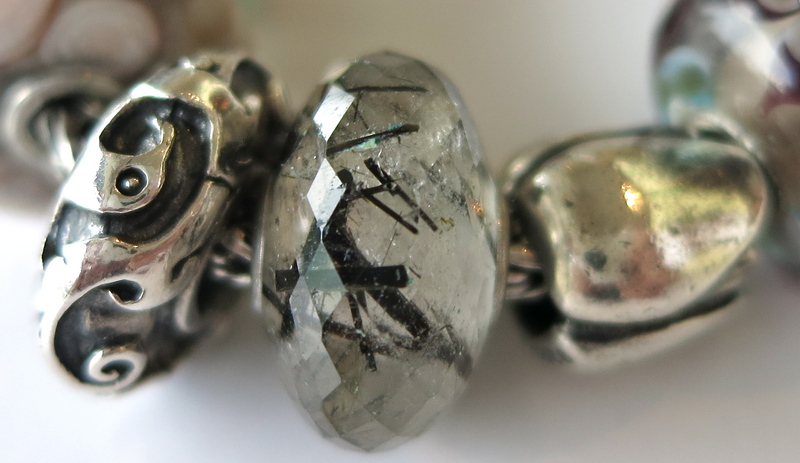 I like to think that this is the sort of bracelet that one could reach for several times a week as we go into the warmer months… The substantial silvers, the beautiful stones, the fascinating uniques – it would never be humdrum. Best of all, it would feel “just right” with everything from a little black dress to jeans and a white t-shirt. C.
the green elements. I love to look at green, but for some reason find it harder to actually wear it. The breakthrough came during the original 30 day challenge, two years ago. By the end of that month I had realized how very useful golden yellows were as complementary tones and neutrals. 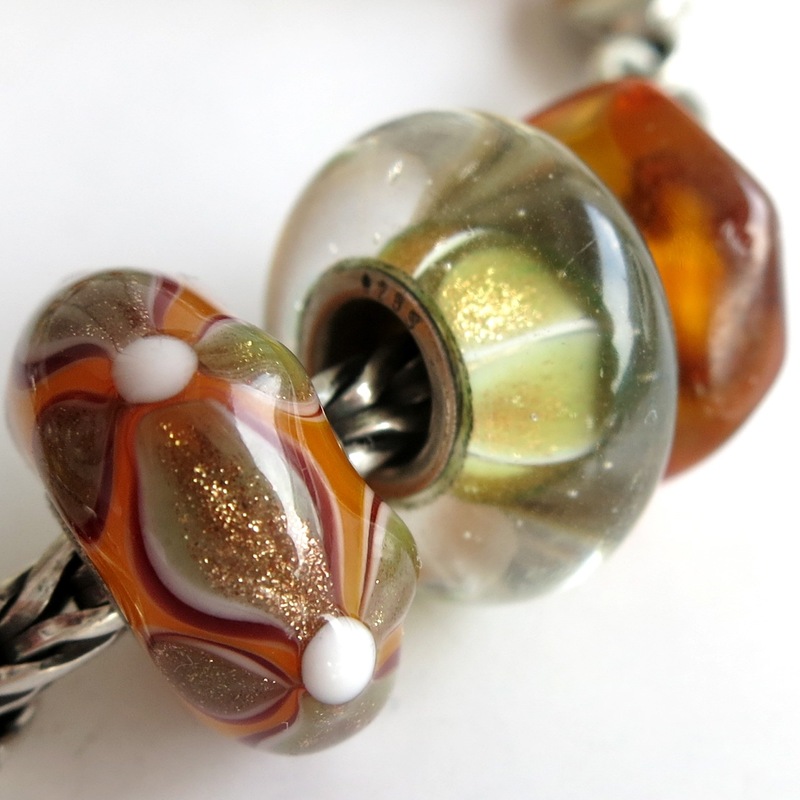 I’ve never thought of myself as a yellow person, even had an aversion to it… but there is no doubt that the golden yellows of Trollbeads… murano glass, natural stone… amber… somehow those yellows are different. These colour elements enhance blues, greens, purples, reds, pinks, even whites. In this case I’ve created a framework of golden yellow to hold a handful of greens that delight me – in limited quantities. The whole design is inspired by the distinctive central bead, a clear golden glass with an aqua green flower floating in its depths. 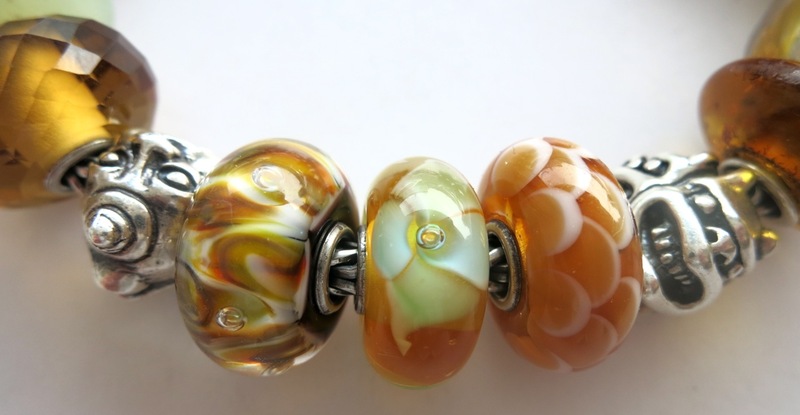 Clockwise from clasp: “Double Lobster Clasp” (retired format), “Unique Amber”, “Unique Glass”, “Unique Glass”, “Bead of Fortune”, “Unique Amber”, “Blue Desert”, “Unique Amber”, “Trollbeads Day 2014 Limited Edition”, “Unique Glass”, “Unique Glass”, “Unique Glass”, “Two Trolls – Limited Edition”, “Golden Quartz”, “Limited Edition Chinese Jade”, “Unique Amber”, “Neither Fish Nor Troll”, “Unique Glass”, “Unique Glass”, “Unique Amber”. 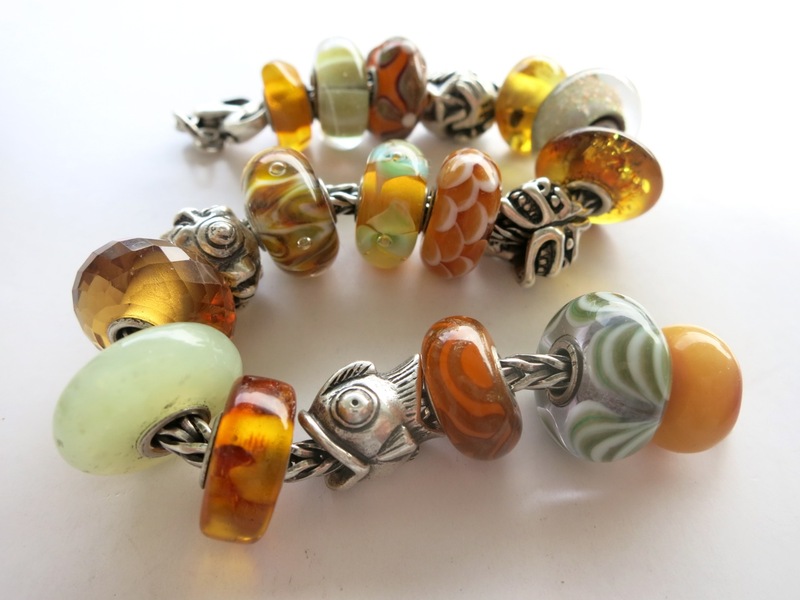 In order to create a bracelet that satisfied my need for pattern and balance, I sorted my ambers more or less into pairs by colour, size and clarity. Then I centred a favorite, barrel shaped alabaster amber and worked my way out, trying to make a pattern and maintain balance as I went. 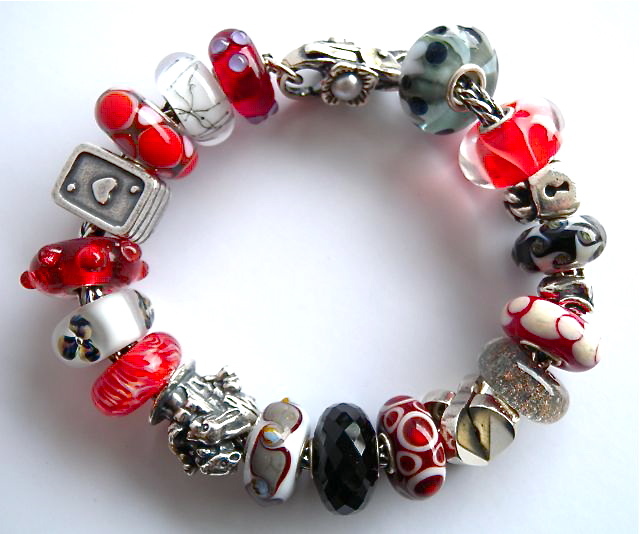 The completely random bracelet is still beyond me – perhaps this year that should be the ultimate challenge for me! 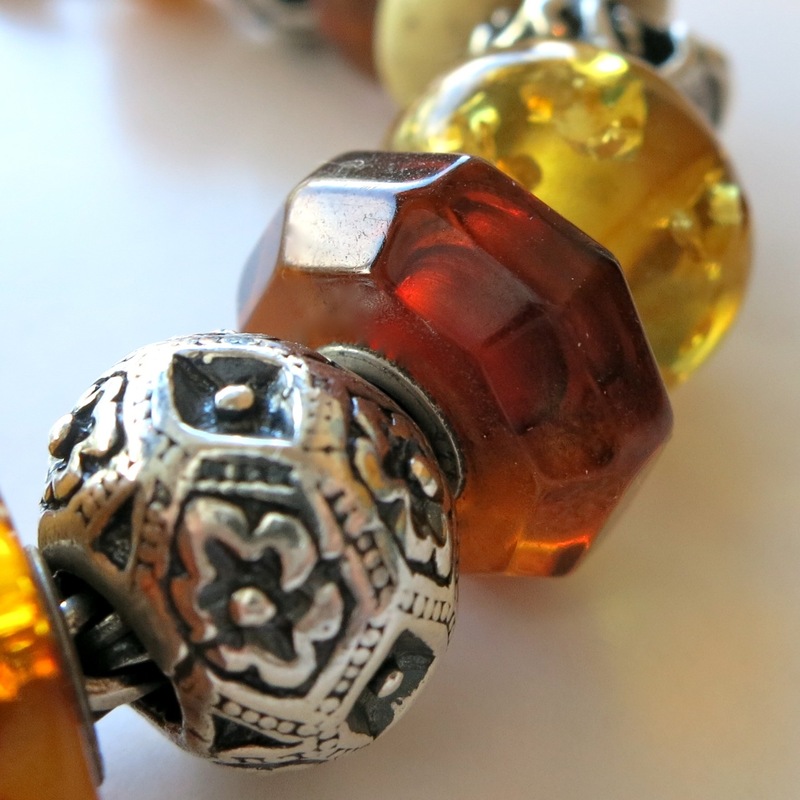 I find the warm and natural tones of the amber to be very calm and soothing – so I thought I would indulge in some more richly patterned silvers whose busier designs could sing in contrast and harmony. 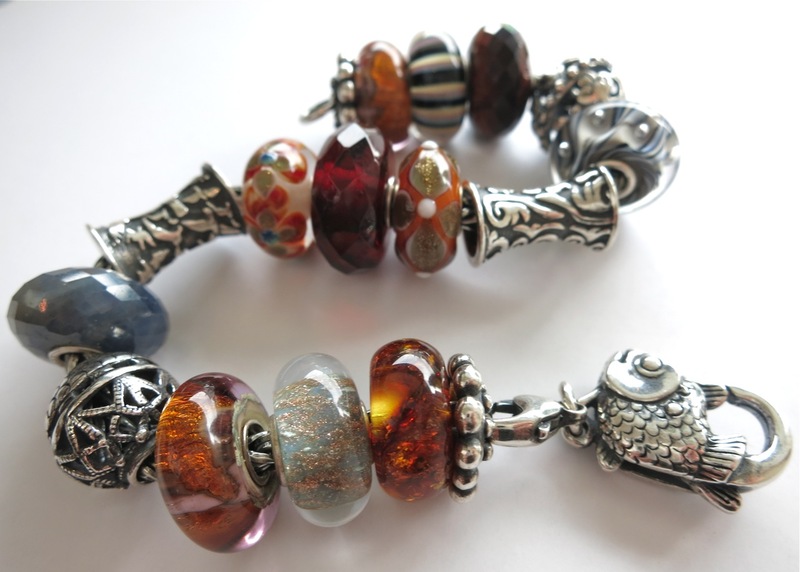 I placed the Anniversary Bracelet “Two Trolls” and the “2014 Trollbeads Day Trolls” opposite each other for additional emphasis. 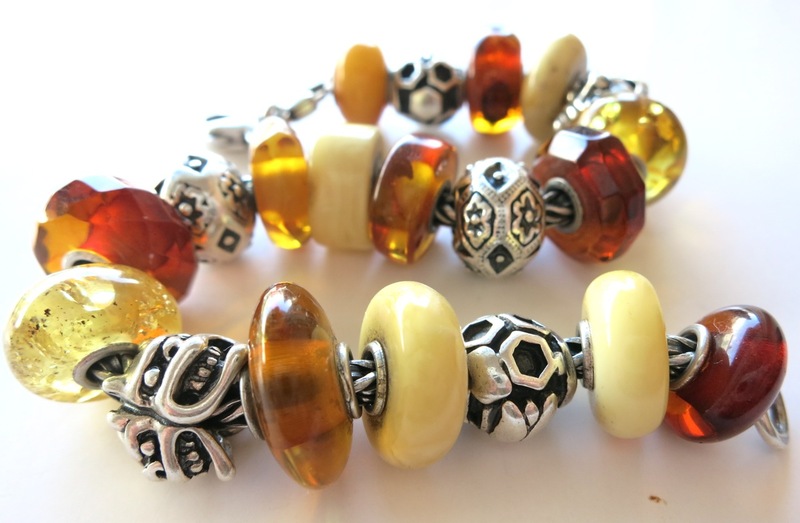 Clockwise from clasp: “Sterling Double Lobster Clasp” (retired format), All beads amber! 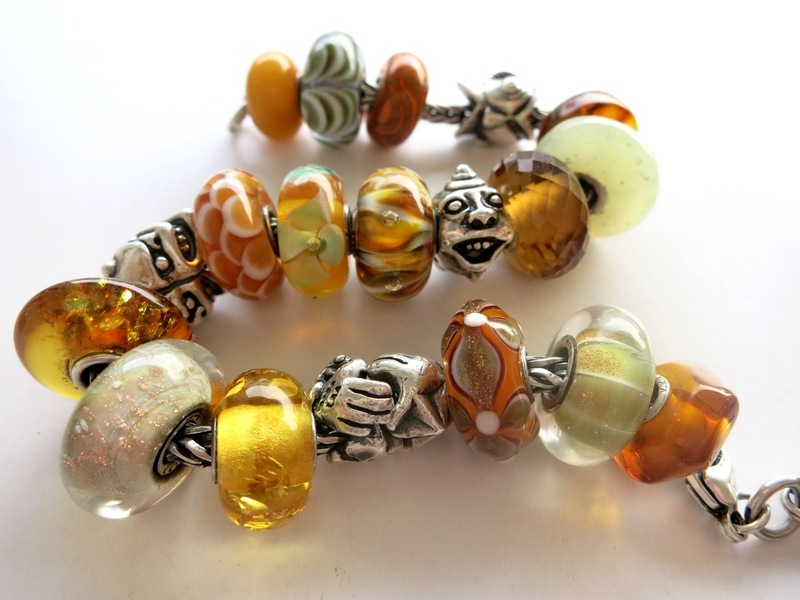 Silvers as follows: “Bee on Hive” (retired), “Limited Edition Two Trolls”, “Zanzibar”, “Zanzibar”, “Trollbeads Day 2014”, “Bee on Hive”. Today I thought I’d play with some of the fresh new silver designs that are intriguing so many of our collectors. Three new designs of considerable size and unusual shape were released as part of the Spring 2015 collection. “Flying Free”, “Wisest of Souls” and “Guardian of Sea” all have a flared, tubular form that feels clean, modern and yet somehow tribal. At an accessible CAD$59 price point, these pieces may easily be combined to create a fresh composition with a strong silver element. In this design I’ve selected “Flying Free” and “Guardian of Sea” for their complementary, flowing patterning. 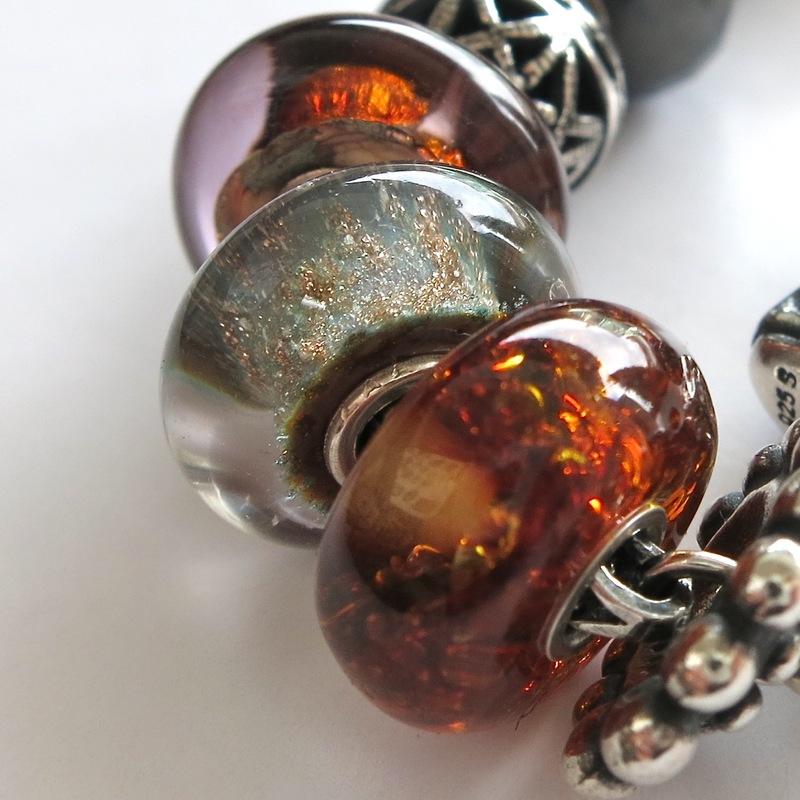 I added two of our favorite silvers from the Autumn collection for a pleasing rhythm of spherical and tubular forms. 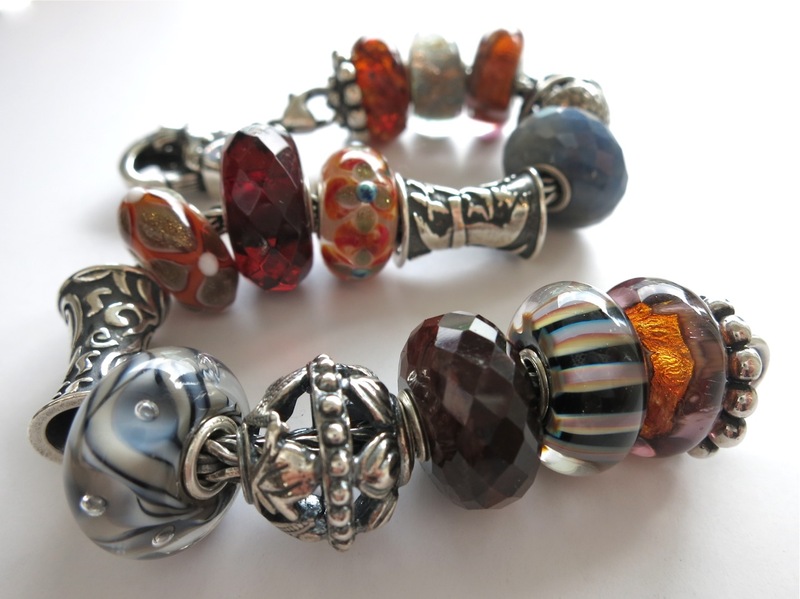 When playing the bracelet together I was happy to note that the round silvers fit beautifully into the flared ends of the tubular designs, and it would be very simple to build an all silver design that was based purely on that combination. For colour I reached for some delightful uniques that recently arrived, and took the cue for my palette from them. The result is a pleasing combination of slate blue, grey, oxblood, butterscotch and deep coral. I so often find fabulous new colour combinations that I never would have imagined just by looking closely at a fantastic unique. Even after years of composing bracelets, they still have surprises to offer me. For grey elements I picked “Neptune’s Promise”, a lovely “Sapphire”, “Blue Desert” and a very colour saturated “Khaki Stripe”. 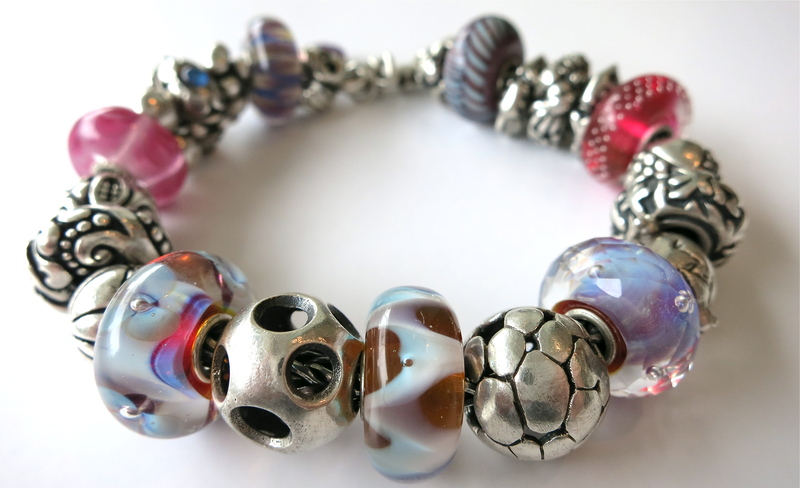 In the end, to create this design only took a few, well-chosen glass, so my only real challenge in creating this bracelet was winnowing down the possible choices and picking the beads that would create the most pleasing palette. Clockwise from Clasp: “Fish Lock”, “Lotus Top”, “Unique Amber”, “Blue Desert”, “Golden Cave”, “Spiritual Ornament”, “Sapphire”, “Flying Free”, “Unique Glass”, “Unique Amber”, “Unique Glass”, “Guardian of Sea”, “Neptune’s Promise”, “Spiritual Adornment”, “red Tigers Eye”, “Khaki Stripe”, “Golden Cave”, “Lotus Top”. How can it be day 28 already?! through the past month and realized that there are still a few walls to break down. First I realized that I still tend to create groupings of three, five seven and so on. The old rule about arranging flowers still holds true for me when composing bracelets, and I should really explore even numbers as well. 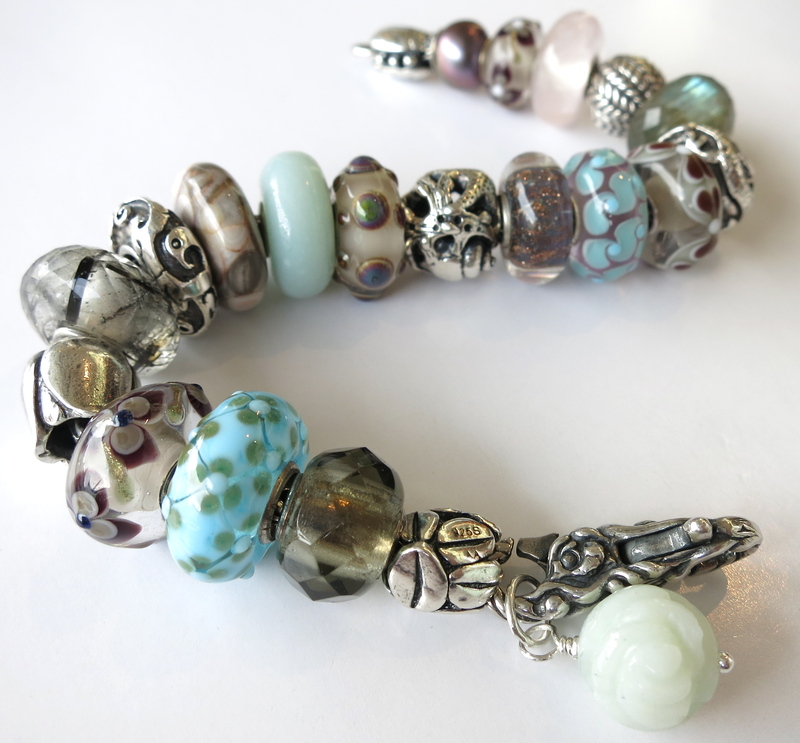 So today you’ll see a bracelet with lots of pairs of beads – which is sure to be a good thing from a Feng Shui point of view! Second, I still load up on glass and use the silvers to divide groupings of glass. So today I tried to use the silvers intelligently as an equal partner with the glass, and I am pleased with the result. 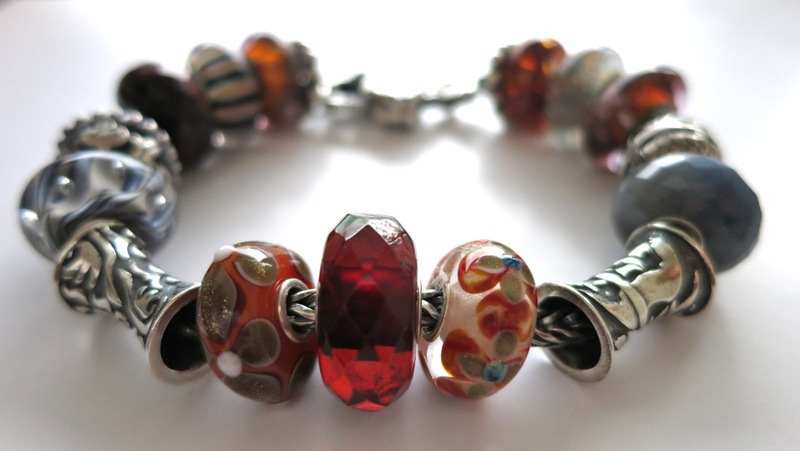 Finally, I realized that I had never placed this juicy red bead on a design this challenge, so I decided to build the entire bracelet around it. The white pattern on the glass suggests a red and white bracelet, but I find that it’s a little too “major holiday” for me to wear. By placing it among honey golds and warm chestnut browns it settles the red and gives an overall rich feel. Much more wearable for me! 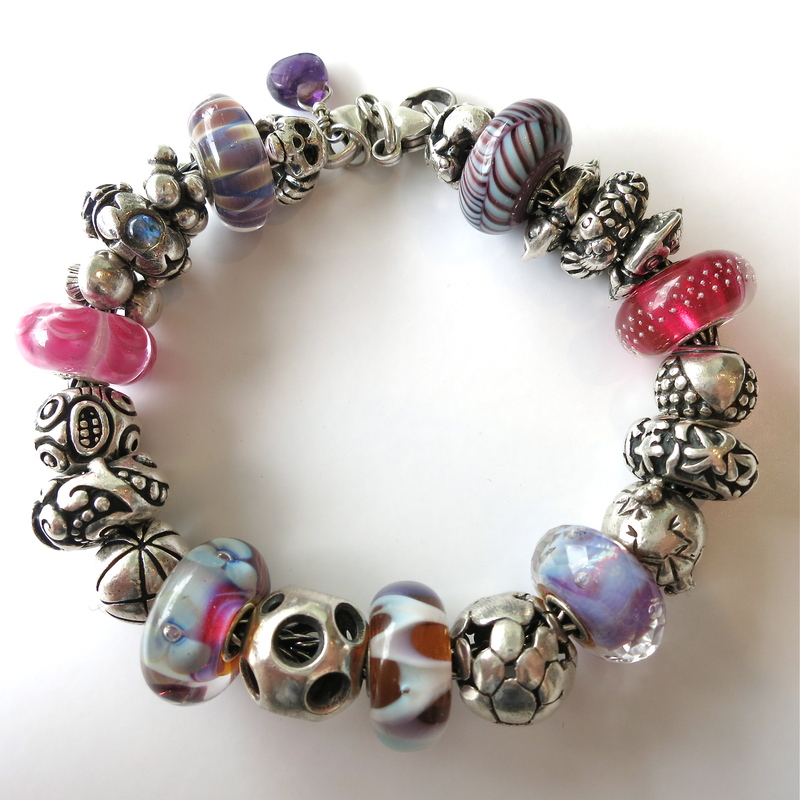 It’s the perfect bracelet to add lots of silver as well – the silver is neutral and calming for these saturated colours. 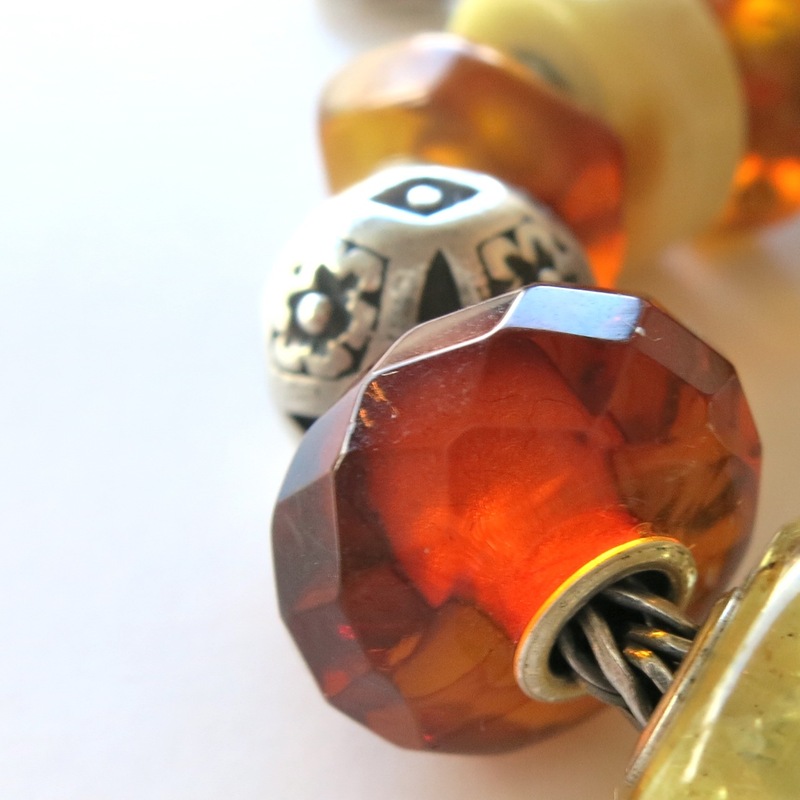 Only two days to go… what’s at the bottom of your bead bowl? 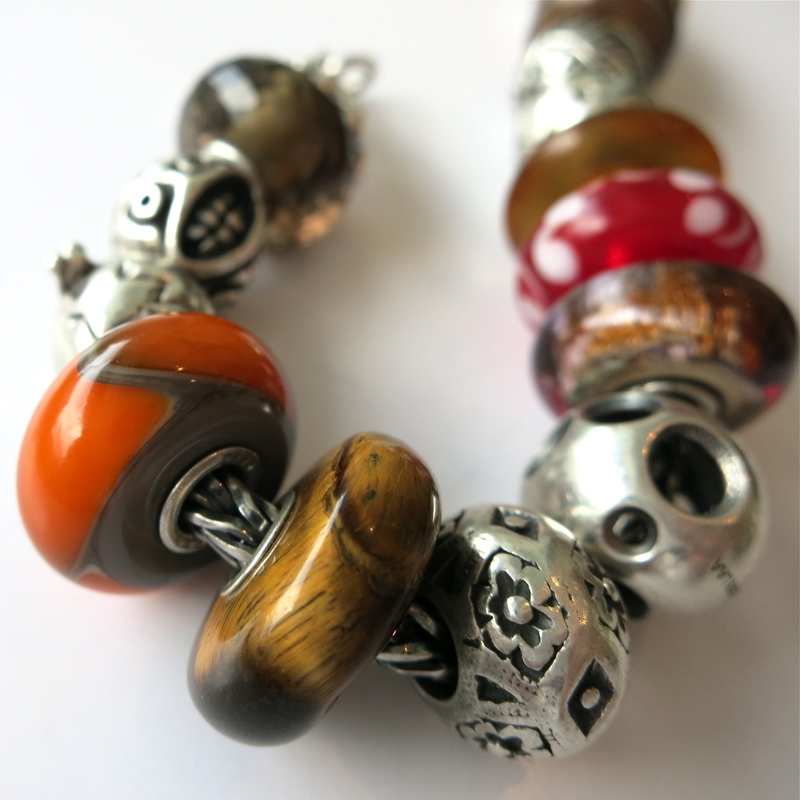 Time to dust off those hard-to-use beads and give them a design of their own…. the eye can appreciate separately from the whole. 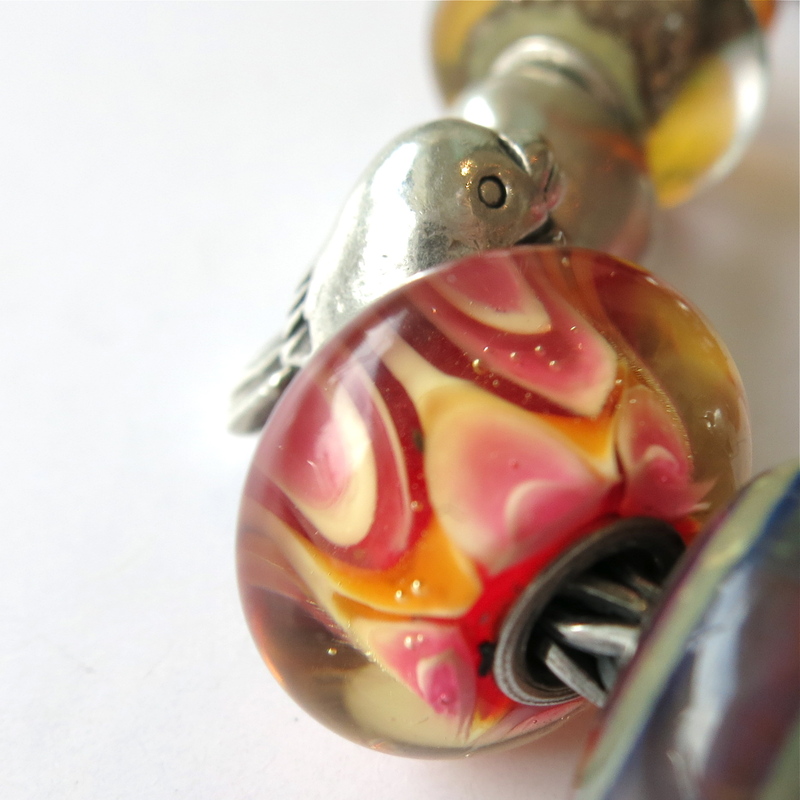 To my eye, too many silvers seem to blur together into a mad mess of pattern, just as all glass blend together into a muddled palette of colour. Having tackled this challenge last year at this time, I remember that the only way I can make sense of all the pattern of the silver is to keep strictly to simple forms and try to create a rhythm, or pattern of them. 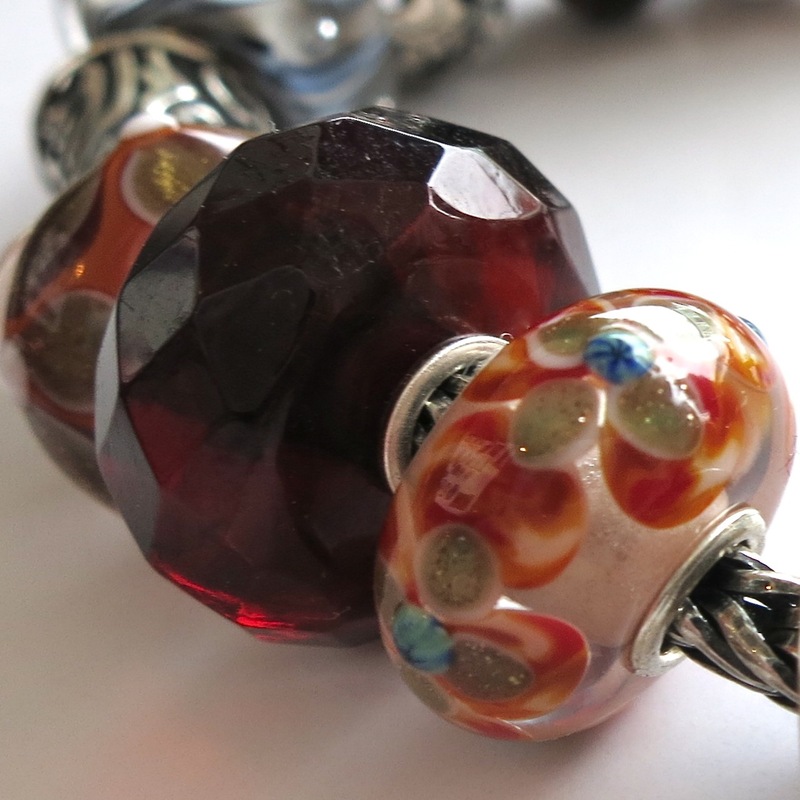 Here I have framed a dramatic center glass with a pair of bold spheres. 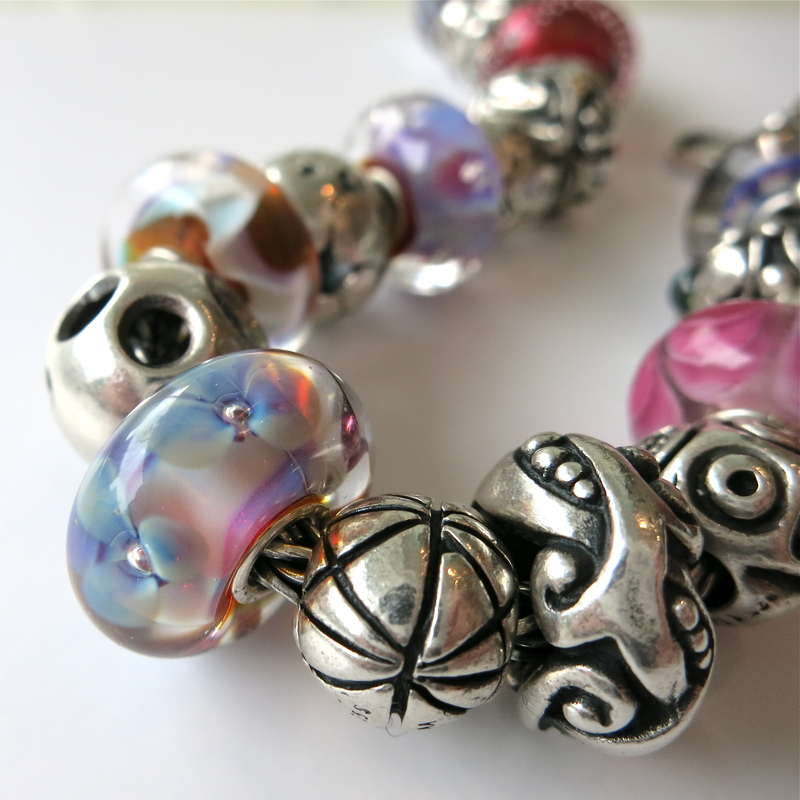 Then I go on around the bracelet to set up patterns of round and “bead shaped” silvers. 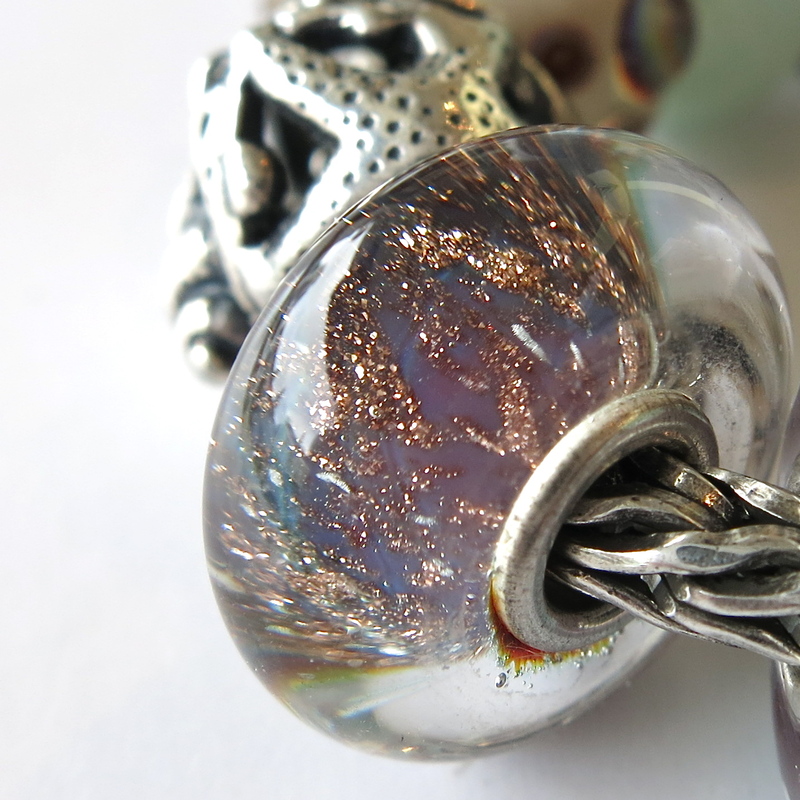 In this case, the glass act as little islands of colour that break up the groupings of silver. 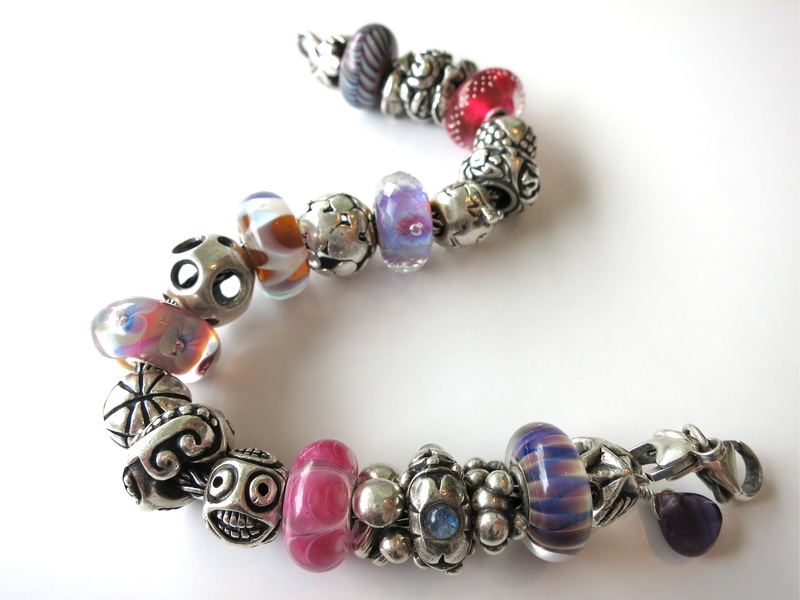 I have essentially reversed the proportions of my normal bracelet designs. Clockwise from clasp: “Basic Double Lobster Clasp”, “Bead of Fortune”, “Unique”, “Happy Fish” (retired), “Chinese Zodiac Rooster” (Limited Edition), “Happy Fish” (retired), “Silver Trace, Pink” (retired), “Etruscan” (retired), “Auspicious” (Limited Edition Hong Kong World Tour), “Frogs” (retired), “Faceted Aurora” (limited edition), “Spot” (retired), “Unique”, “Shortcut” (retired), “Aurora Flower”, “Petanque” (retired), “Jugend”, “Faces” (retired) “Unique”, “Mushrooms Family” (Limited Edition Baltic States World Tour”, “Carved Flowers” (retired), “Cells” (retired), “Violet Petals” (Limited Edition), “Bead of Fortune”. 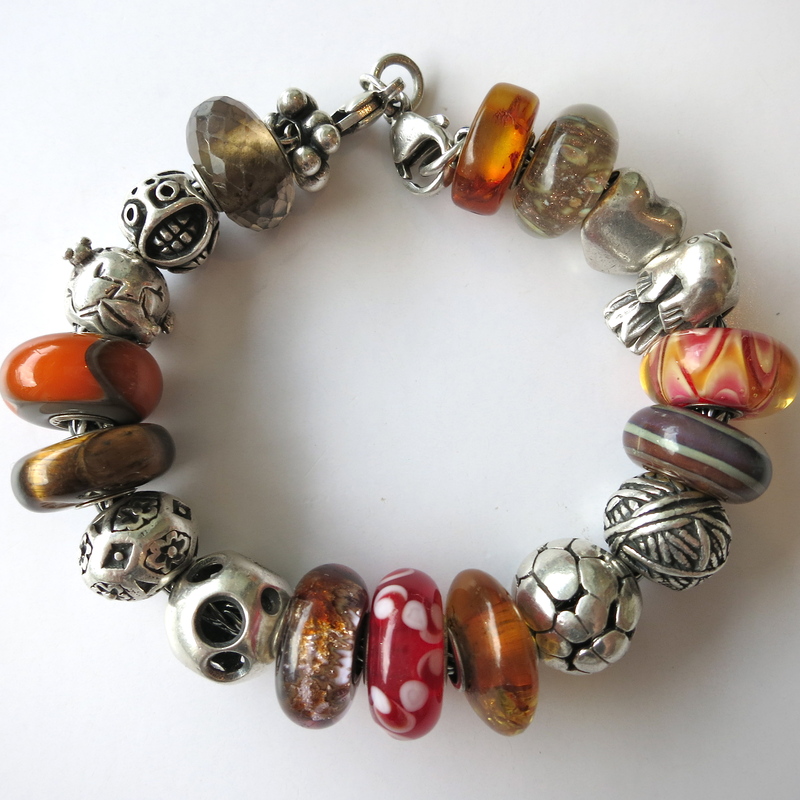 One final note… this bracelet is surprisingly heavy, but feels wonderful on the arm! 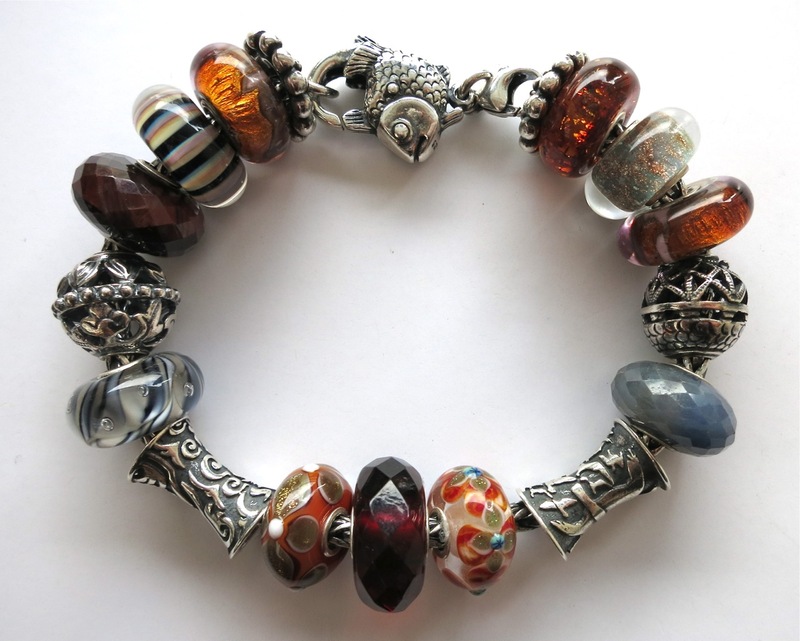 I adore this bracelet… everything about it appeals to me, from the soft and wearable palette, to the seductive glass and stones… to the rare, retired silvers that give it its rhythm. it’s wonderful! 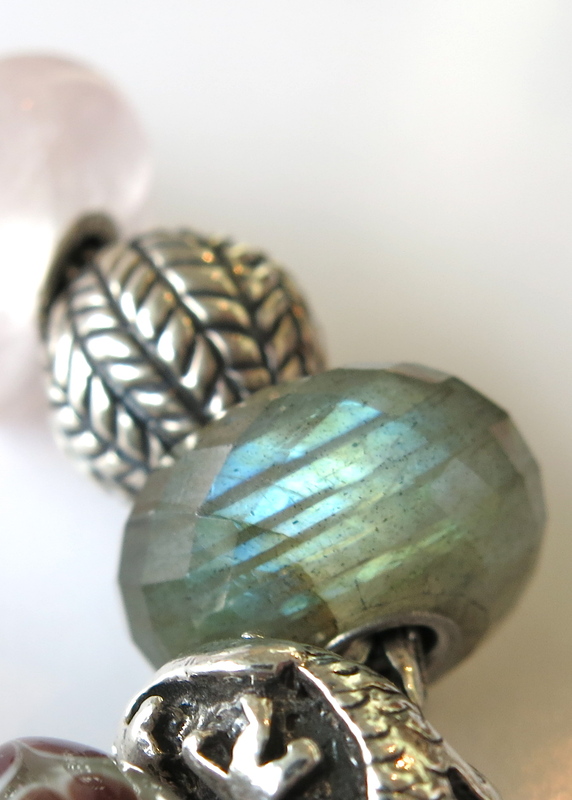 This remarkable “Labradorite” feels to me like a keystone element of the bracelet. 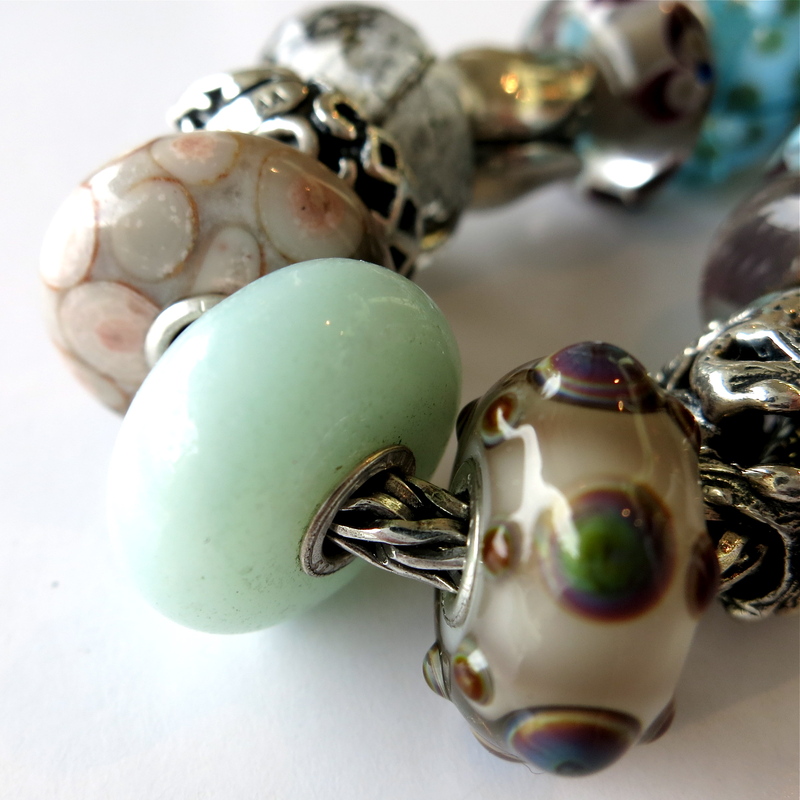 The brilliant, aqua flash in the stone is just stunning and perfectly sets the tone for the entire bracelet design. 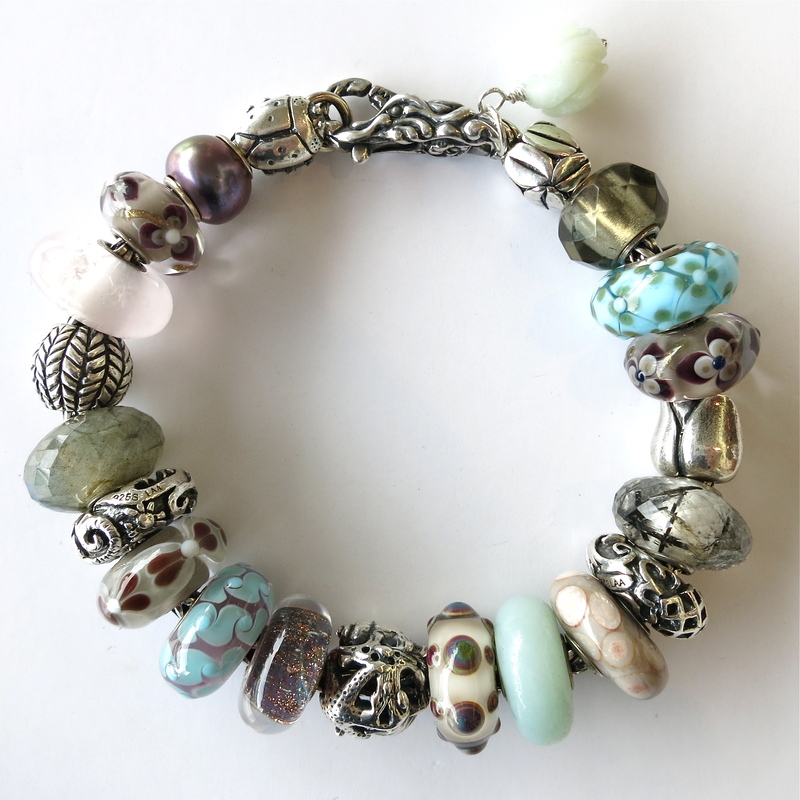 Tartooful customer RC has artfully picked up the colour refrain across the entire bracelet, but also utilized muted neutrals to maintain a calm, subtle and sophisticated palette. “Labradorite” is a perennial favorite for us at Tartooful and this design displays just how breathtaking this natural stone can be. 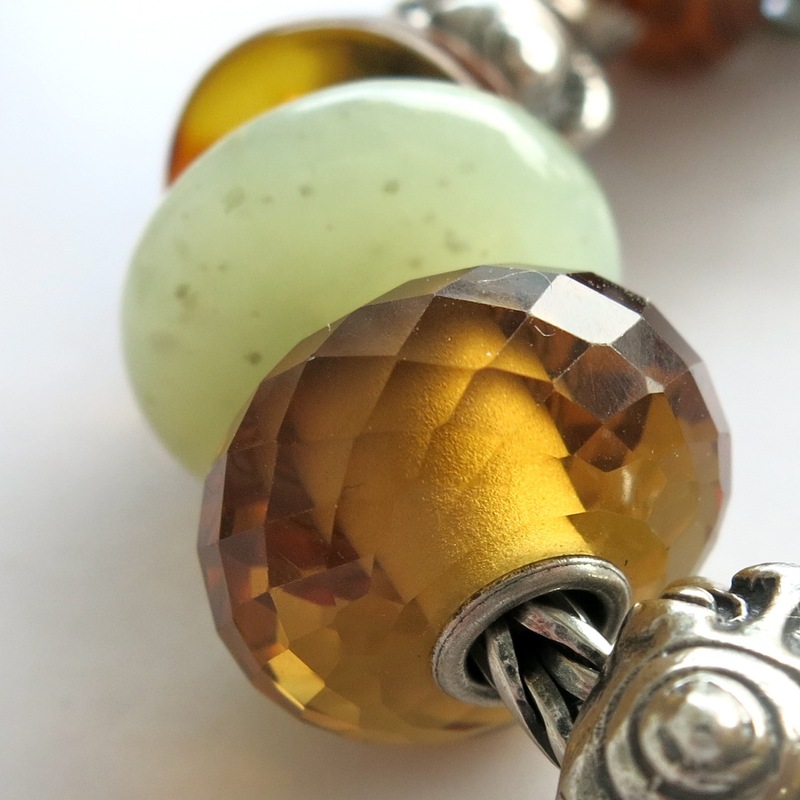 found over time that it is most successfully deployed as a grey bead, in softer palettes, where its unique texture can stand out and be appreciated. In stark black and white designs it feels unsatisfyingly muddy, as it’s simply too organic. Here it shines among other greys, oysters, taupes, plums and delicate, celadon blue. I love how RC’s plums are so understated and natural. This is not a purple bracelet. 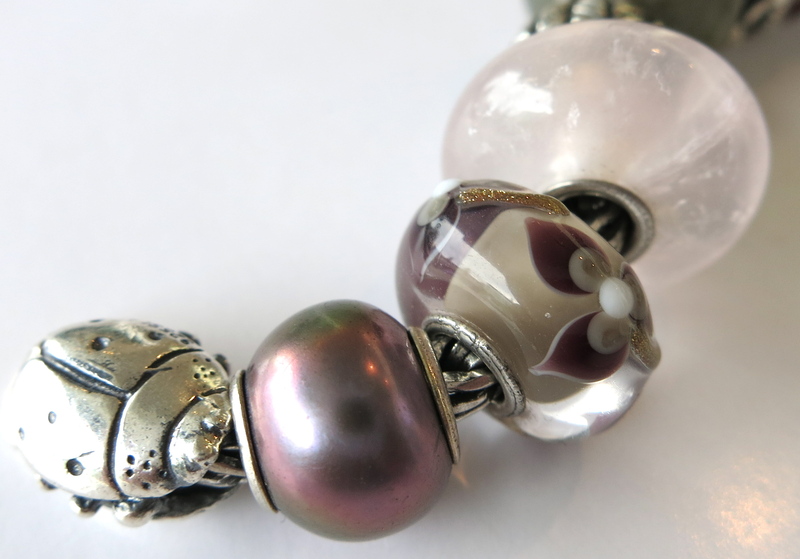 Note the iridescent haze of plum that shines on this Limited edition “Peacock Pearl”… the plum undertone in its neighbouring unique, and the hint of plum in her unusual specimen of “Blue Desert”. 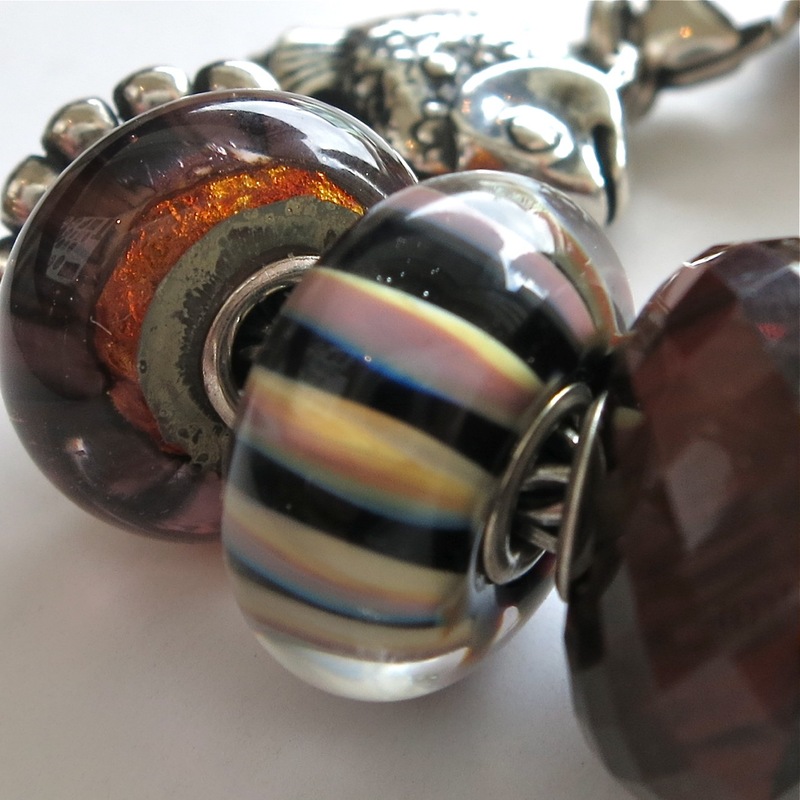 It’s a wonderful reminder that fabulous beads can come from all parts of the Trollbeads collection – regular stock items often offer fascinating diversity of appearance. Each glass truly does show the hand of its artist maker. Everyday design… but far from boring! All beads from RC’s private collection. 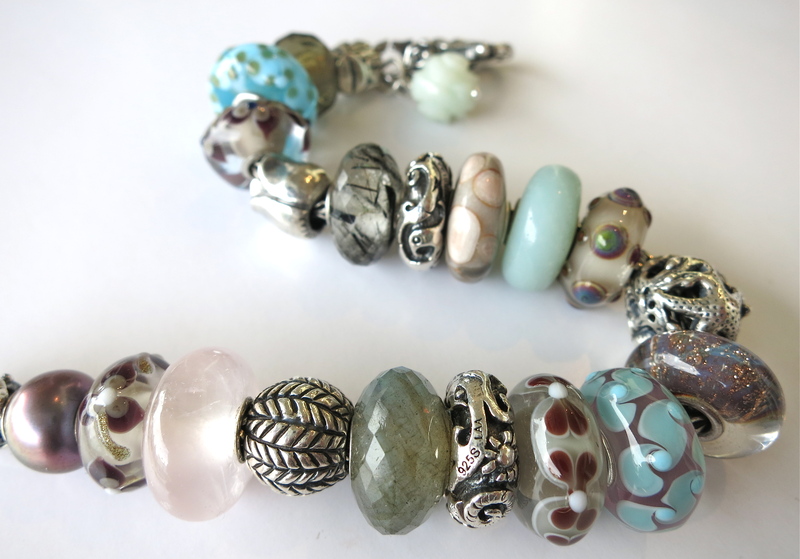 I can’t sign off on this entry without mentioning the Limited Edition, Mint Jasper Stone bead. It’s a lovely creamy colour of celadon green, and, of course, very rare, desirable and elusive. Here RC places it near the center of the bracelet, where it can shine in the spotlight. The very green “Urchin” next to it basks in its glow! 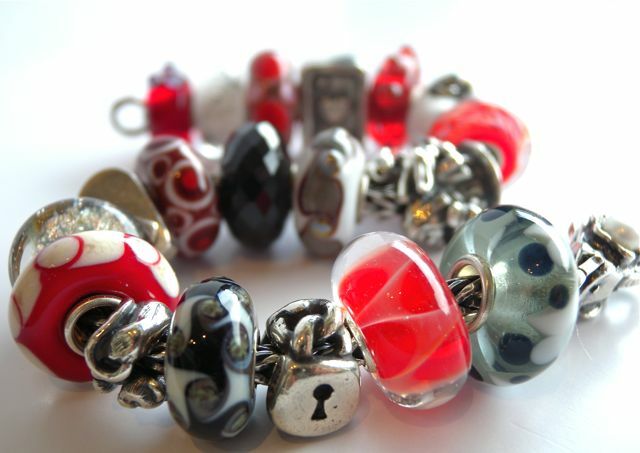 Is Your Trollbeads Collection Conceptual or Practical? It’s a question that has arisen more than a few times over the past couple of weeks… is your Trollbeads collection more “Conceptual” or “Practical”? If this isn’t a topic that you’ve considered before, you may not be familiar with the dilemma. 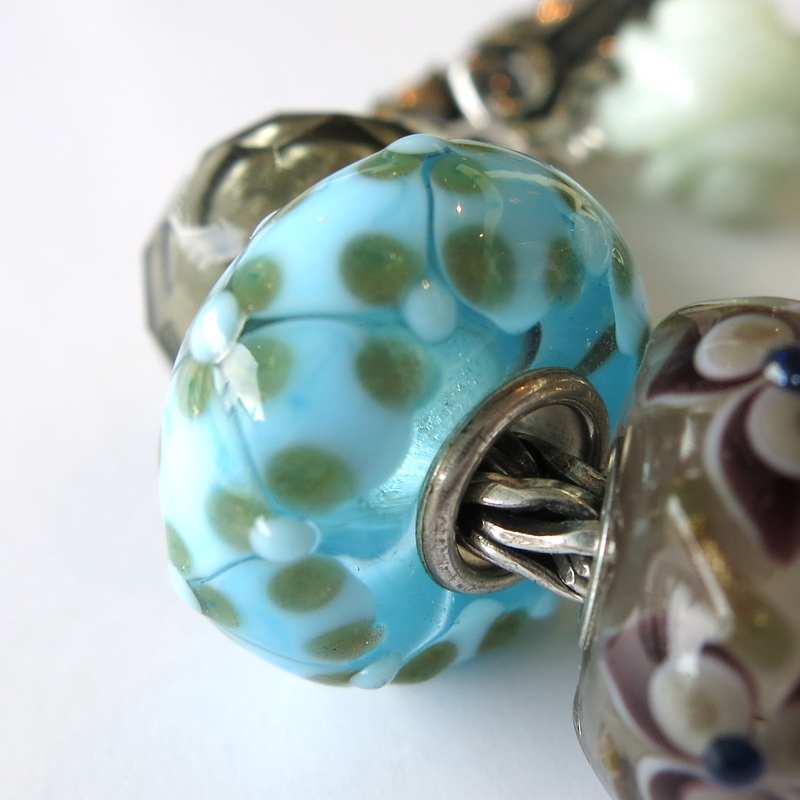 We’ve noticed over the years that there are certain bead designs, and types of compositions that lend themselves to daily wear – the white tees and blue jeans of the Trollbeads collection, if you will. 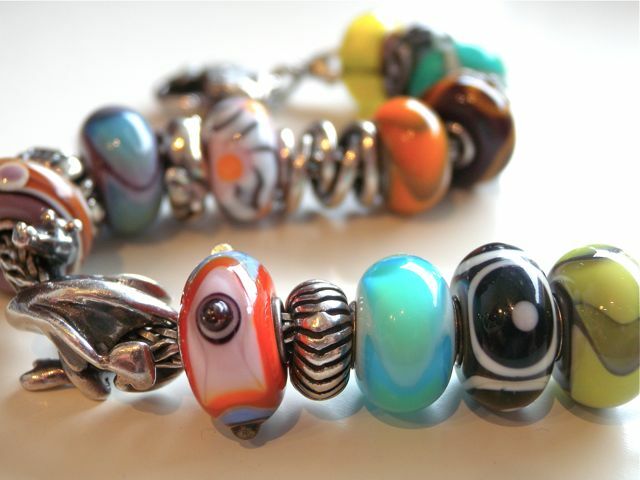 Then there are other bead designs that are destined only for more occasional wear. What’s a Trollie with broad tastes to do? 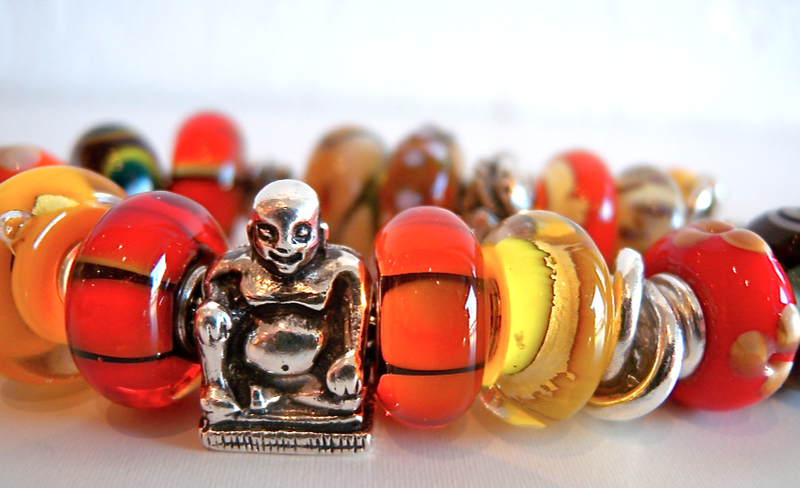 “The Buddha Bracelet” – by MS – photographed at Tartooful 2010. 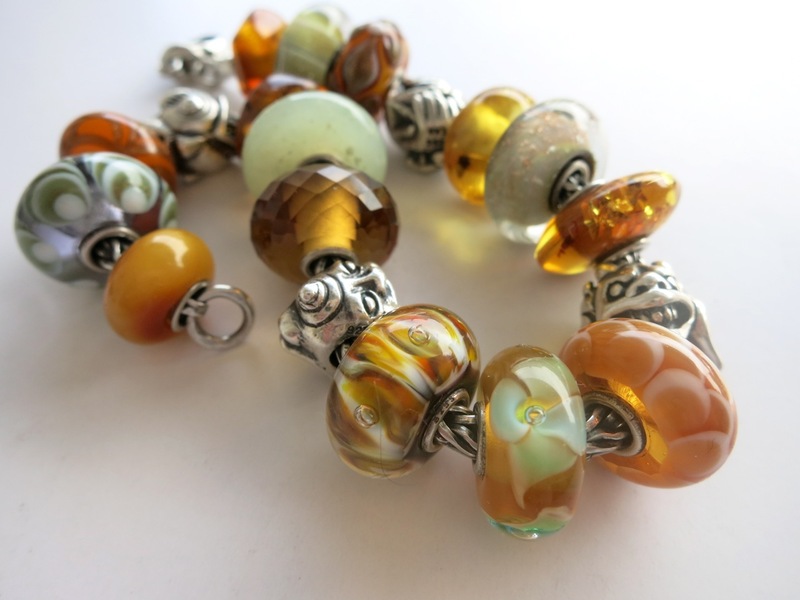 We’ve remarked before on beads that are best enjoyed as tiny, perfect sculptures. 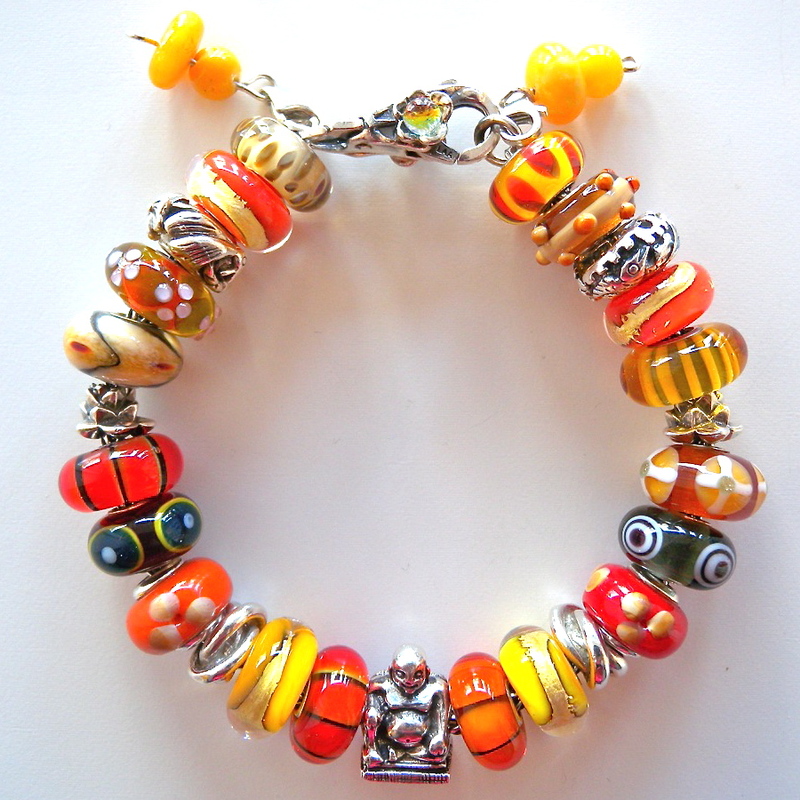 Examples include the “Seer” the “Buddha”, and the “Juggler”. They invite display on a acrylic stand – imagine how fascinating to have a grouping of these miniature objets d’art on a side table. 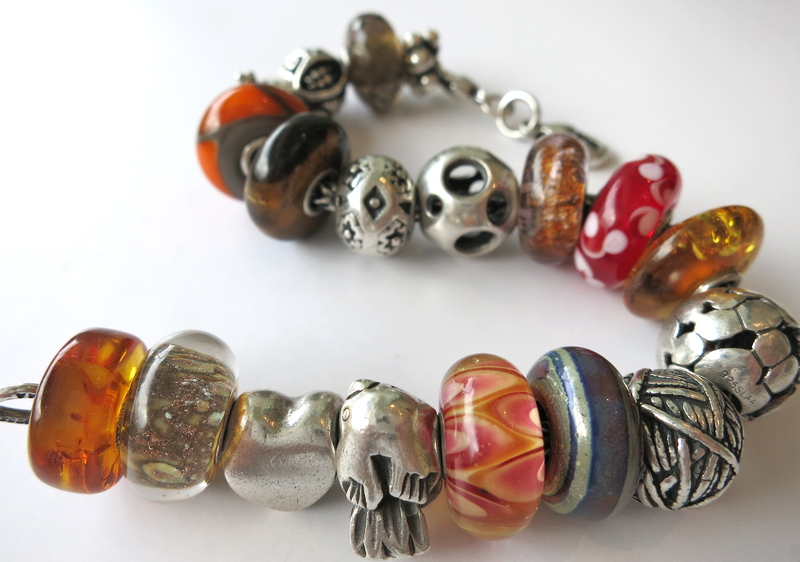 Understand that I love these beads… everything about them – flat bottoms and all. In my collection there is room for all sorts of beads; daily use ones as well as the ones that I will enjoy viewing more than wearing. That is truly the heart of the matter. “Alice in Wonderland” bracelet design by PY, photographed at Tartooful 2012. 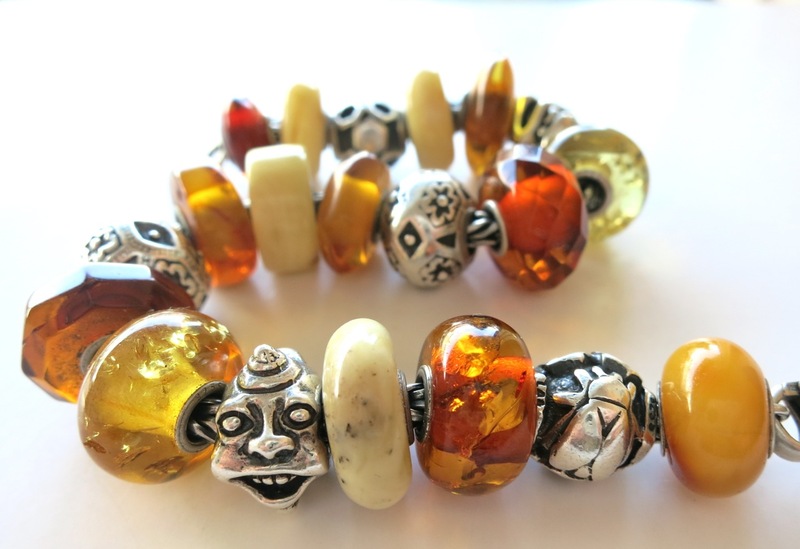 Whether it’s a single bead, or an entire composition that only gets worn on occasion, the important thing is to enjoy your collection. Enjoy wearing those go-to designs, those “Practical” pieces that work effortlessly with your busy life… and equally enjoy those “Conceptual” ones that give you joy every time you glance at your dressing table. Like a fabulous pair of stilettos, or the perfect shade of red lipstick, those trickier bracelets are just right for certain occasions. So give yourself permission to let go of any misplaced guilt, and revel in those compositions every day when you see them, knowing they will be waiting for you when the moment is right. Today we’ve offered some fabulous examples of more “Conceptual” designs – total eye candy! 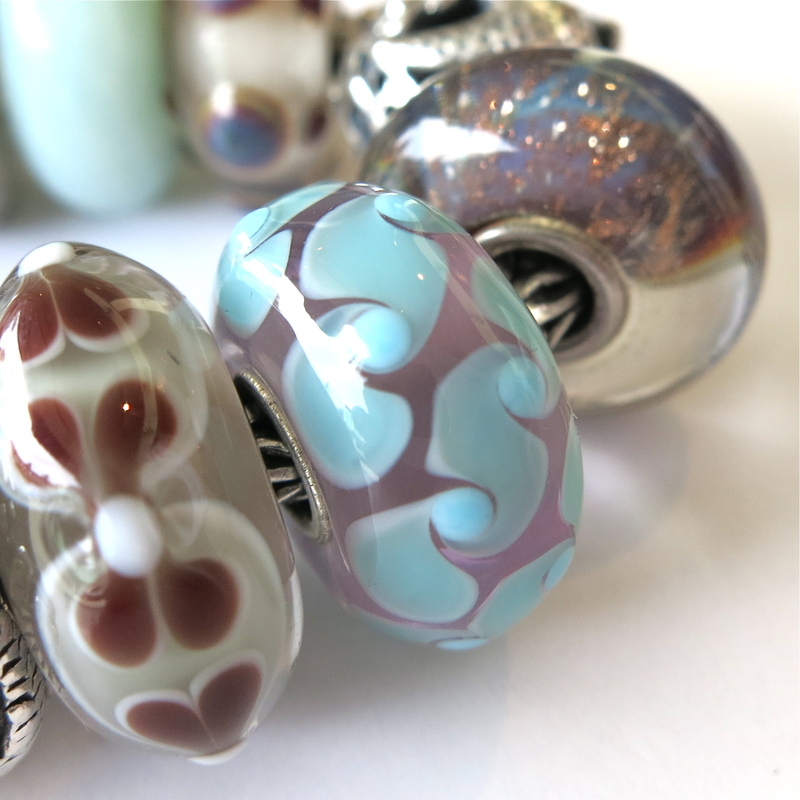 Stay tuned tomorrow for an equally beautiful bracelet that is destined for everyday enjoyment.